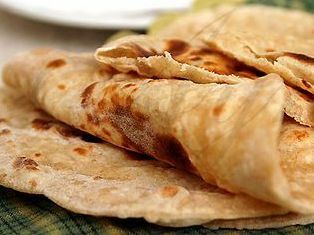 I’ve been craving hot buttered chapatis lately. Here’s some chapati images from my files, plus a recipe. Chapatis are one of India’s most popular breads. They are enjoyed especially in the northern and central regions of India. They are partially cooked on a hot griddle and finished over an open-heat source. 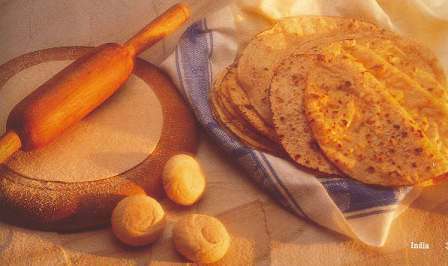 Chapatis are made from special wholemeal flour called atta, available from Indian grocers. If unavailable, substitute sifted wholemeal flour. You can spread melted butter or ghee on the chapatis after they are cooked. Chapatis are usually served at lunch or dinner and are great whether served with a 5-course dinner or just with a simple dal and salad. Makes 12 chapatis. melted butter or ghee for serving. 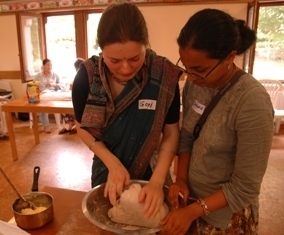 Combine the chapati flour and salt in a mixing bowl. Add up to 2/3 cup of water, slowly pouring in just enough to form a soft, kneadable dough. Turn the dough onto a clean working surface and knead for about 8 minutes or until silky-smooth. Cover with an overturned bowl and leave for ½ – 3 hours. Knead the dough again for 1 minute. Divide the dough into 1 dozen portions. Roll them into smooth balls and cover with a damp cloth. Preheat a griddle or non-stick heavy frying pan over moderately low heat for 3 – 4 minutes. 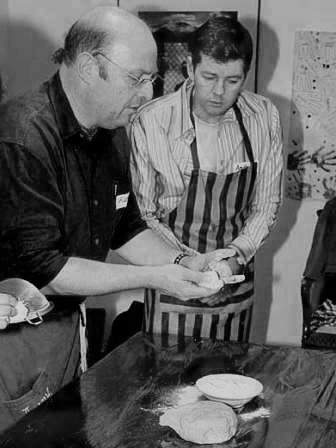 Flatten a ball of dough, dredge it in flour, and carefully roll out the ball into a thin, perfectly even, smooth disk of dough about 15 cm (6 inches) in diameter. Pick up the chapati and slap it between your hands to remove the excess flour. Slip it onto the hot plate, avoiding any wrinkles. Cook for about 1 minute on the first side. The top of the chapati should start to show small bubbles. Turn the chapati over with tongs. Cook it until small brown spots appear on the underside (about minute). 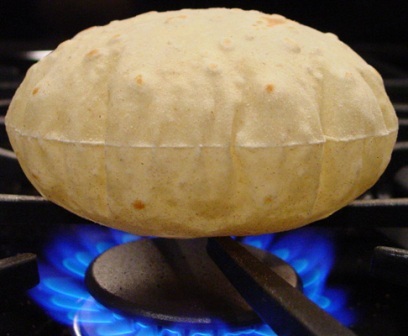 Turn on a gas jet, pick up the chapati with your tongs, and hold it about 5 cm (2 inches) over the flame. It will swell into a puffy balloon. Continue to cook the chapati until it is speckled with black flecks. Place the cooked chapati in a bowl or basket, cover with a clean tea towel or cloth, and continue cooking the rest of the chapatis. Serve: when they’re all cooked and stacked, you might like to butter them. Serve chapatis hot for best results or cover and keep warm in a preheated warm oven for up to ½ hour.